Remember back when I said I’d do this trip write up in 3 or 4 posts? Well, I lied. I meant five. Next up, a collection of moments involving food. First meal: I don’t eat meat. A friend who had been to Istanbul a few weeks before our trip wrote me one day and said “Kebabs everywhere. I’m worried for you!” But it turns out a no-meat diet in Istanbul works out just fine. I do eat seafood though, as evidenced by the first image above. 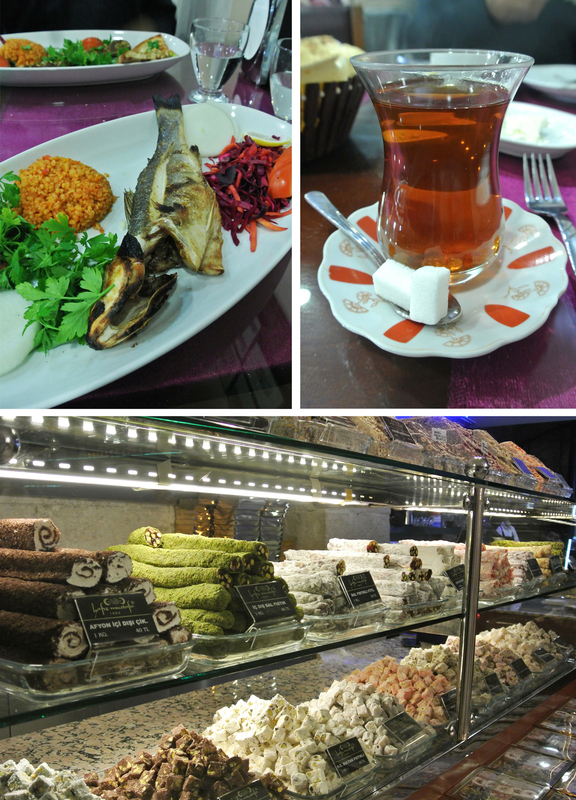 Our first meal in Istanbul in a little cafe full of locals close to our hotel. Meals we had usually come with two types of starch, rice and potatoes or bread. Vegetables were plenty, especially at the more self-service style restaurants. I won’t lie, not eating kebabs did make me a little sad. But brother had plenty for us both. And the seafood was delicious. Tea in Turkey: ubiquitous, almost a ritual, almost a habit you don’t realize you’ve fallen into until on your fourth cup in an hour. Once you realize that, you switch it up and start drinking the sweet apple tea instead of the regular Turkish tea. Always in these delightfully shaped glasses. Turkish delight and other treats: It just so happened the cafe with all of these treats was right by the handiest tram stop for us. And so it just happened that we found ourselves here…a few times. What this case of sweets image doesn’t show is the long counter full of baklava varieties to the right, and the gorgeous pastry case a bit further in. Brother was more for the pastries & cakes, I was all about the baklava in its various forms. This cafe is where I tried to answer the ages-old question of “how much baklava is too much?”, a question which still remains unanswered. 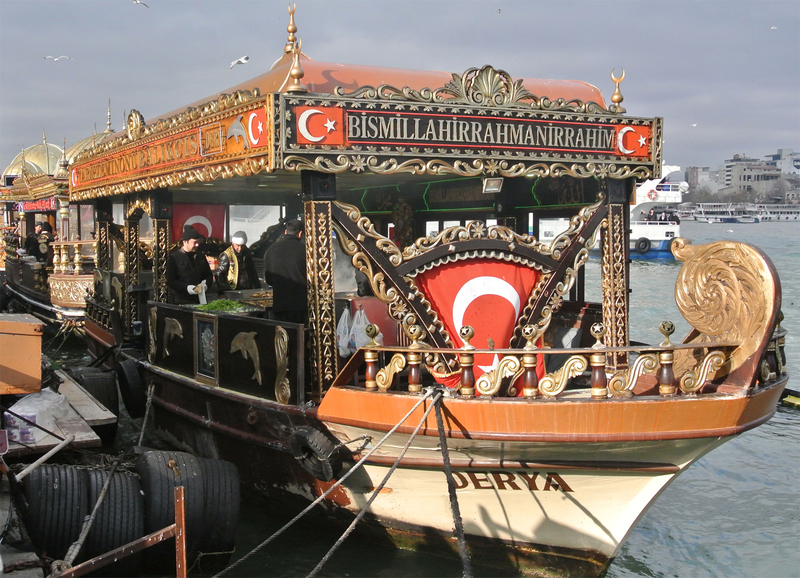 Here was also the scene of my multiple attempts to drink Turkish coffee—fair to say I am not good at that. Despite my best efforts, despite observing how the locals drank their coffee, and despite my love for really strong coffee. Note the men at the grill. They are turning through a LOT of fish filets in a SHORT amount of time. My sandwich had a bit of fin still on it (must have been overlooked in the SUPERSPEED of the cooking & serving), but aside from that, the sandwich was fresh & good. Just bread, fish, lettuce, onions, and sauce if you choose to add it. Not fancy, but just what you need for a cheap & replenishing quick lunch. Vegetable and fruit bins in a small market. Not much to say here, other than I found this mode of produce selling to be much more energy and water efficient than the markets I frequent at home. Which was refreshing. 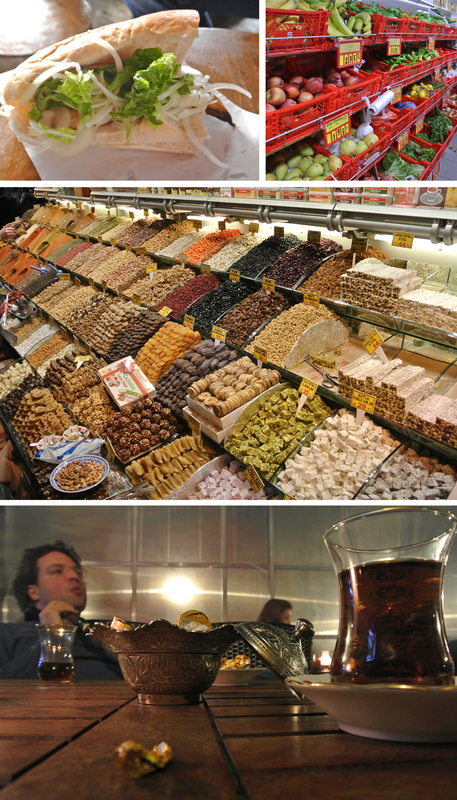 Ah, the spice market, full of spices and dried fruit and Turkish delight and teas and so many goodies. Mention ‘saffron’ and the vendor’s eyes light up, they take you into their shop to show you the good stuff in a tin from under the counter. And of course, supply you with glasses of tea and little bits of Turkish delight while you negotiate. Outside of the market are more shops, the well known coffee vendor Kurukahveci Mehmet Efendi Mahdumlari is across the street—all you need to do to find this place is follow your nose and the line of people getting their fresh ground coffee for the day. The line can be long but the staff is efficient and the locals know what they’re there to get, have exact change ready, and are in no mood to waste time. So it moves fast. The not-so-alcohol-free typical beverage is raki, similar to ouzo. 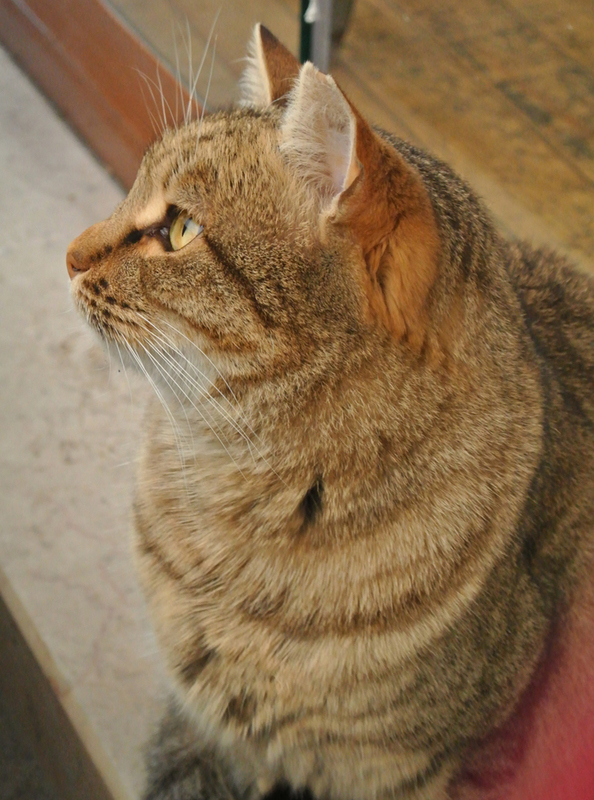 I do not have any pictures of moments involving raki, but know that I remember them all, they weren’t too out of place for me, (Really, I’ll throw down some waltz steps in any piazza or square, including Taksim Square, raki influenced or not. Though it may have helped.) and felt fine in the morning. Our last night in Istanbul was spent at a little cafe with water pipe, where the friendly proprietor kept bringing us tea. Kept Bringing Us Tea. And a plate of fruit, and a little dish of candies, and a popular yogurt/milk drink, and more tea. We spent the evening munching, drinking tea, playing backgammon, and trying to blow smoke rings. Neither of us managed a true smoke ring, but there was a man at the table next to us who was doing so flawlessly. I wonder if he noticed us staring. Readers, I don’t know why I look so frightened. It was a clay pot. With meat inside. When the meat is cooked, the server taps the clay pot with a metal rod until it splits in half, then spoons the meal onto a platter. I’d like to say the pot splits with a huge explosion, which would account for my expression, but no. It’s more of a “pop” and then the top just falls off. Brother got lucky with snapping this picture at the right moment I suppose. He also enjoyed his exploding clay pot meat lunch.